Keep batons close and accessible with the Duty Tuff Econo Nylon Expandable Baton Holder from Stallion Leather. 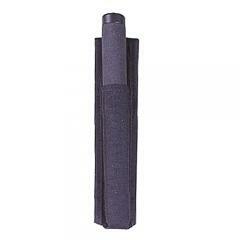 The expandable baton holster omits unnecessary frills and distracting features to deliver a tactical holder that is both highly efficient and economically priced. Its cylindrical shape snuggly holds the baton in place during intense physical activity, leaving enough of the handle exposed for instant grasping and rapid deployment. Its open-top construction prevents catches and snags, guaranteeing quick weapon access when it is needed most. The holster is fabricated from "Duty Tuff", a premium nylon blend that ensures lasting durability to withstand extreme conditions of tactical applications. The Econo Holder fits duty belts up 2-inches wide.